Re: So what game(s) are you currently playing? I playing those Android games right now. Like Shall We Date series. I want to play voltage games..but it doesn't work on my tablet. ehh ...I thought voltage game is a Android game..whats a different actually..
Kouryuu wrote: I am annoyed at the limited energy thing. yeah..me too..thats another reasons why I don't play online game too much.. I heard voltage doesn't have the issue. Anyhow, Voltage games cannot be played on tablets even if they have the right OS..so yeah. That is why I am wailing in despair. It depends,I just joined and im willing to spend quite alot of time checking for good otome games i have never tried yet. Mononoke Kiss: 2/3 characters played. Never Look Back: 2/3 characters played. Heian Love: 5/8 characters played. Pirates in Love: 6/8 characters played. In your arms tonight: 3/9 characters played. Plus a bunch of VN GxB waiting, from Lemmasoft Forums. oh..is that so..I really though voltage game=android game ..uhuh..I was left behind technologies I guess ..
hahah..this forum and Lemmasoft forum has a lot of otome/VN game haha..its almost make me crazy..
woah...so many game..good luck..your play on phone..I wonder how your phone can support all of that game.. Currently playing Hakuouki Demon of the fleeting Blossom. Really enjoying it so far though long VN's make me rather sleeping. Okita's smile keeps me going though! 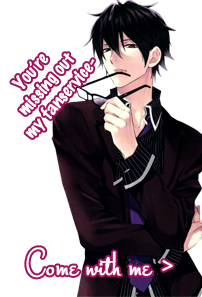 I'm currently playing Sweet Fuse: At Your Side ~ . I think I have a few other games that I haven't completed all the routes for, but schoolwork and other work won't allow for any more than the tiny spurts I do have . I'm currently replaying Starry Sky (my computer was wiped so rekindling my knowledge of them) whilst waiting for [You must be registered and logged in to see this link. ], [You must be registered and logged in to see this link. ], and [You must be registered and logged in to see this link. ][You must be registered and logged in to see this link.] to come out. Also been putting off playing [You must be registered and logged in to see this link.] but getting around to it and I still need to finish some routes for [You must be registered and logged in to see this link.]. I just started playing BinaryStar (that's how I kill my time on the train everyday~). I'm loving Tchicai so so much. And now it's Nazagi's turn !! However I don't recommend this game, if you have to buy it. It's not worth it's price. And also, I'm playing Sweet Pool, I'm going for Mita Makoto's route. Hopefully. I know this isn't a VN, but... SMASH 4 for 3ds. IT'S AMAZING!!! Also Ace Attorney v Professor Layton. It's really short though, and there are still some bugs. I'm still struggling with Norn9 ~Norn + Nonette~ Just finished Kakeru for Koharu and Akito for Nanami happy ends and right now I'm really confuse which one I must chose for Mikoto pairing? Itsuki (easy-going guy); Natsuhiko (mysterious, always carry a gun, hot looking guy); or Sakuya (prince-like, osananajimi, and yandere) uwaaah... I'm confuse! i'm playing Step ~Our Relationship Step by Step~ but it's slow going because i'm TLing it at the same time orz. i'm also playing the demo of Multiuniverse Myself and liking it a LOT. tomoe is awesome!! Playing Hakuouki: Stories of the Shinsengumi. It's not a terribly long game, but I still haven't finished it. Recently finished Saito's path, and I loved it! Onwards to Hijikata's path! I'm getting some great ideas from reading the replies on here though. Currently on Liberta's route, and whoa... I'm shocked a little. Doing Jolly's route right after Luca's was hella weird! Non-otome: Fire Emblem Awakening, having fun with all those possible couples AND their kids! Trying to get better at Gods Eater Burst... really want to play online with someone in GE2 Rage Burst! Fiuuh~~ After two weeks busy with works I'm able to play otome games again... Kyaaa!! Ah, I've clear all happy ends and epilogue for Norn9 and right now I want Norn9 Last Era so bad!!! Mind giving your opinion on the game later? I'm kinda interested!